When designing our home we undertake many steps and put in a lot of efforts to style the best décor for our home. But often, when it comes to the ceiling the thing that comes to our mind is white and flat. However, a great ceiling design whether it is in the living room or kitchen or bedroom can render your room with a unique, inimitable and individualistic picture leaving a lasting image in the minds of those who visit your home. There are different ceilings which are suited for each home and each room of the home, depending upon the space available, the walls, and the overall theme of the house. There are unlimited options available for you to choose from, to find an exclusive and exceptional feel for your home. 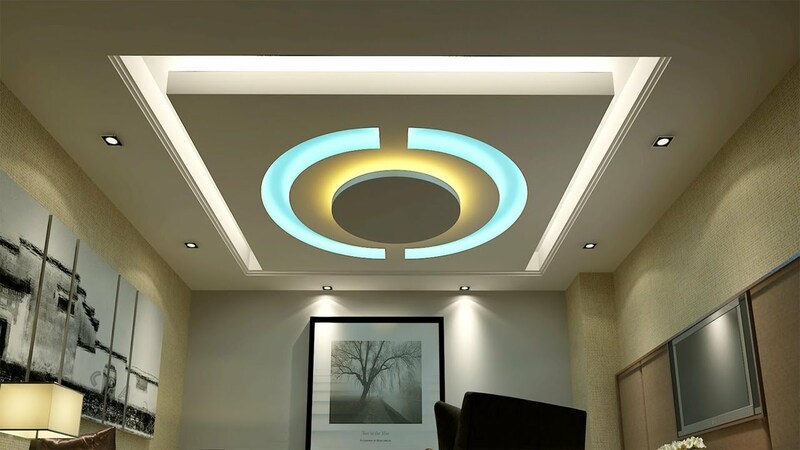 If you wish to have a modern ceiling for your room, you can do much more than experiment with just plain lights and a plain color. There is a great variety of items to choose from with form and function. You can also include beautiful LED lightings and add an exquisite roof design. You can also add a sleek and stylish modern alternative by adding pendants and chandeliers, which can do wonders to an existing room. Many times a custom design ceiling offers a unique and brilliant appeal to alter the visual appearance of the room in a grand fashion. You can also experiment with a cathedral roof that can make your space feel unique, a drop roof design can offer a more compact and contemporary twist that is in line with the modern design trends. 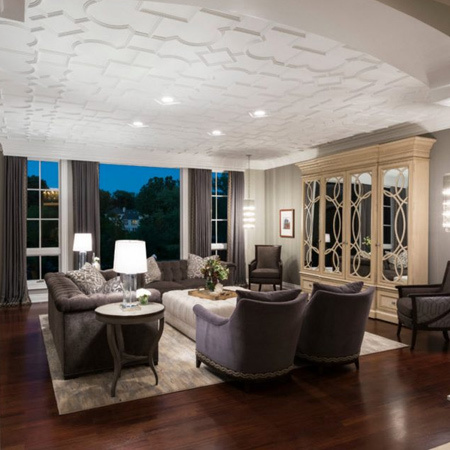 A coffered ceiling gives your home the feeling of a sense of height and an airy feeling giving it an old English charm. It gives a more spacious and a modern look which can be created by using a Tray ceiling and it works in the best way for homes with a higher ceiling and gives you a fresher perspective. If you want to go for the classic beam look for your home, there are plenty of options available to replicate this look. This type of ceiling can blend well with the theme of the home and the theme while stealing the spotlight in a truly seamless fashion. Apart from choosing the classic white for your ceiling, you can also add some texture to it by experimenting with the molds and patterns. 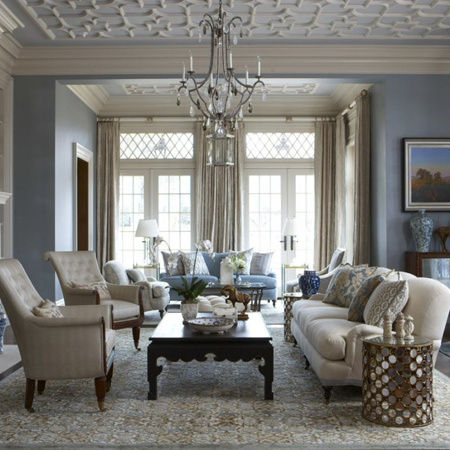 Molding can be applied to the ceiling itself, with detail trim and crown molding for elegance and to take this design just a notch above spectacular. Redesigning your ceiling with lights can be somewhat of a challenging task. You need to take some precautions such as keeping the exact measurements in mind to ensure the perfect ceiling design. If you want to add lighting to an existing ceiling, LED lights will come to your rescue. LED lighting offers you with a wafer-thin design which allows installation at any place in the home, including the ceiling. Cove lighting is one of the popular options in the market today, for many contemporary and modern homes. Cove lighting offers you with a smooth option which is pleasing and soothing for the eyes and not very bright and shiny. This type of lighting installation requires that a bulkhead is fitted around the perimeter of a room, and a bulkhead can be as small - or as large - as space allows. If you wish to accentuate the ceiling pattern and make the room more detailed, you can incorporate crown molding as a part of the ceiling design. 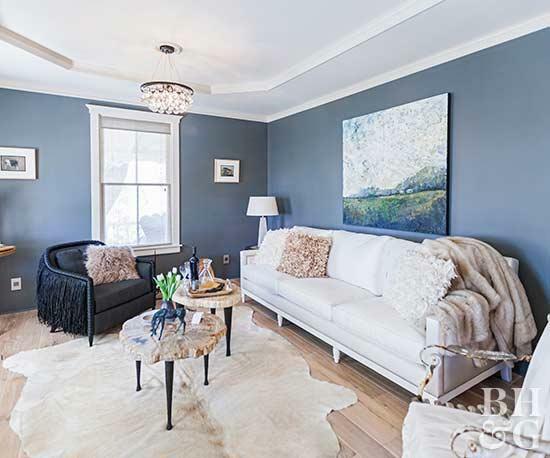 You can add a border between crown molding and the ceiling pattern and paint it with soft and light shades which can be repeated with soft furnishings. You can easily add more detail and pattern to the design of your ceiling to match your room. 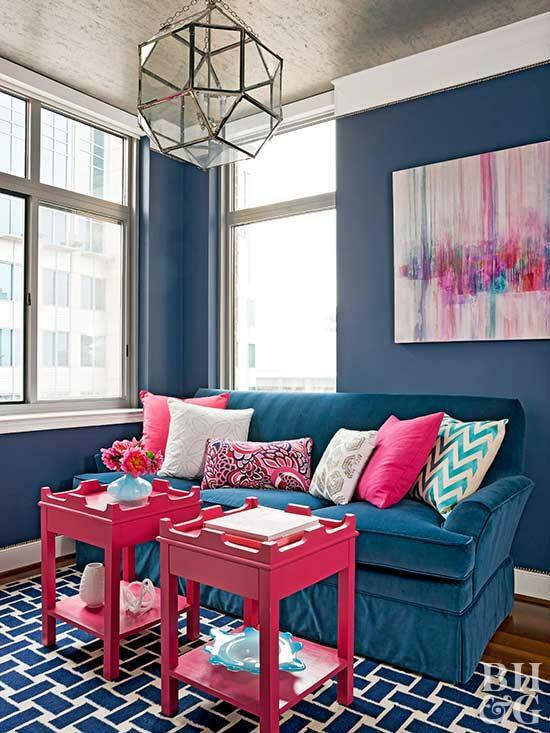 You can experiment with different patterns and geometric designs whichever one you feel is best suited to your style. There is also scope to brighten the dark walls with trim lighting which highlights the ceiling and makes it an eye-catching feature. 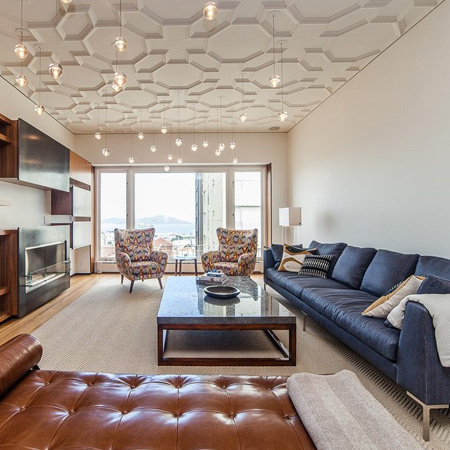 Today, many concrete ceilings are very common and prevalent in many homes’ ceilings. However, having a concrete ceiling does not mean that you cannot experiment with it or add any style. You can use molding, and molding as a feature can be applied to any ceiling. 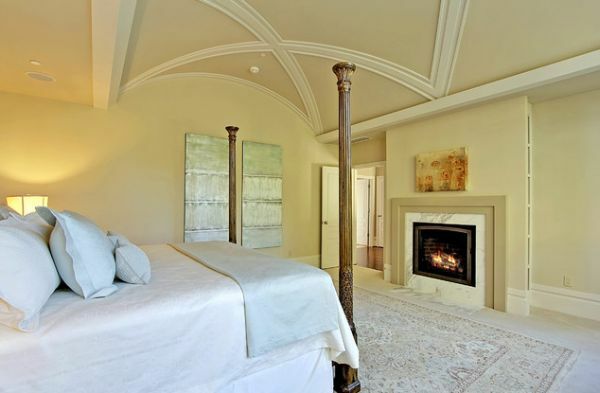 If you talk about designer ceilings, they go with almost every room, including a bedroom. Especially in case of rooms with high ceilings, or rooms which are lacking in detail, a ceiling can become a striking feature. You can combine a detailed ceiling with some crown molding and wainscoting or trim for even more impact. So, why should you lay in bed looking at a blank ceiling when you can enjoy and be inspired by a beautiful ceiling? While designing our home, we tend to focus more on the walls and floors and less on the ceiling. 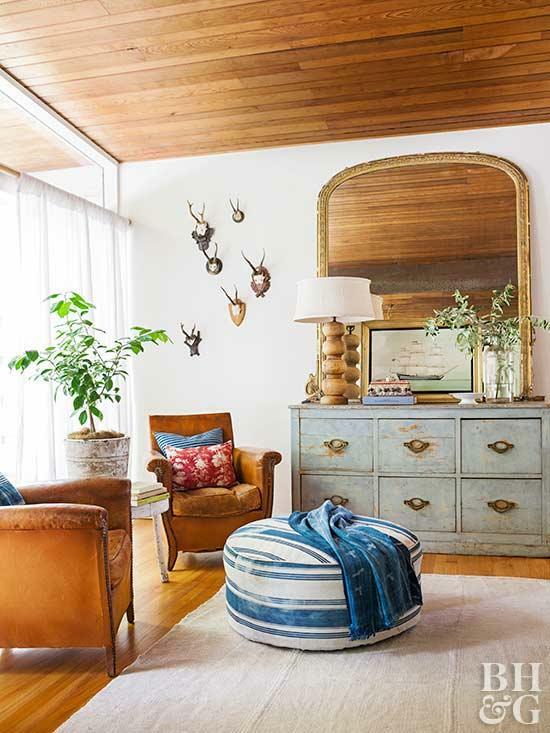 So, think beyond the floors and walls and add pattern to your ceiling as well. You can paint it, wallpaper it or even add or install a style mosaic. Have plain ceiling? Look no further? Add some color to your ceiling by extending the paint off your walls all the way up to your ceiling or you may also add a totally different shade to make your ceiling stand out and by adding some vivacious color to your room. This can make your ceiling a truly highlighting feature of the room. If you've got high ceilings and you want to add lighting, a dropped beam ceiling is a good solution. 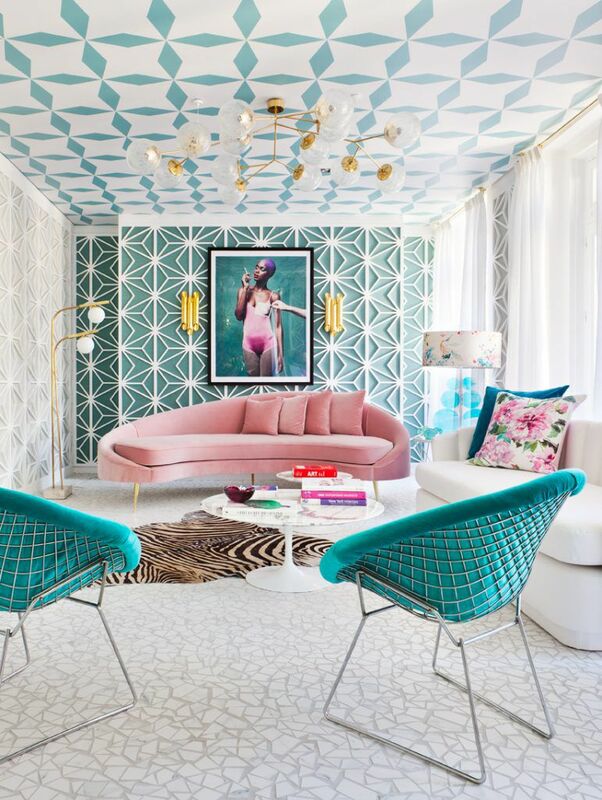 If you're going with modern, funky decor, it creates cool, geometric lines to compliment it. This helps to add some more character and personality to your home. Today, roof beams are traditionally made from hand-hewn trees or solid-sawn lumber. Forest engineers have recently invented ‘glulam’ beams, which are created from many layers of flexible wood strips glued together to form robust laminated wood beams that, can form curves and arches as well as straight runs. These beams help to give a great form to the architectural shapes. Nowadays, many homes have different building material s hidden below it. When you are remodeling your ceiling, you may consider showcasing your home's natural building materials for ceilings, walls, and flooring. This helps to give your home a more natural and yet gives your ceiling a whole new edge over a regular white painted ceiling. You may not always be lucky to receive a lot of natural light in the room, but don’t get disheartened, you can easily change this by the way of adding a metallic ceiling. This kind of ceiling will very cleverly bounce off the natural light of the room, by adding metallic wallpaper. 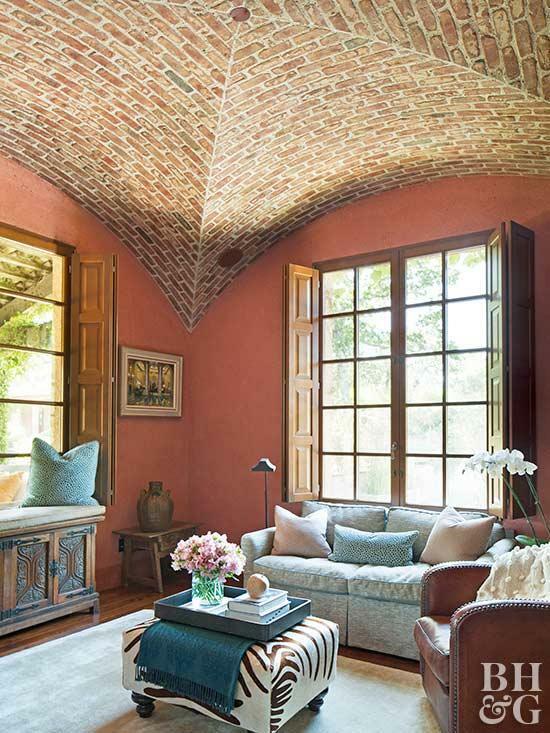 This ceiling treatment lightens the room and adds warmth and character to the jewel-tone space. You can go totally crazy with the ceiling, and make it a unique highlight of your room. You can add box beam ceiling packs with a design packed inside each of the boxes. The rest of the space can include built-ins, trim, white rugs, or light accent colors which do not feel very overwhelming. This will help to add some life to your home décor. An elegant living room can surely shine if it gets an overhead treatment which is befitting its traditional style; a tray ceiling. Framed out in drywall and set off with heavy crown molding, this ceiling idea contributes to the room's sense of intimacy. 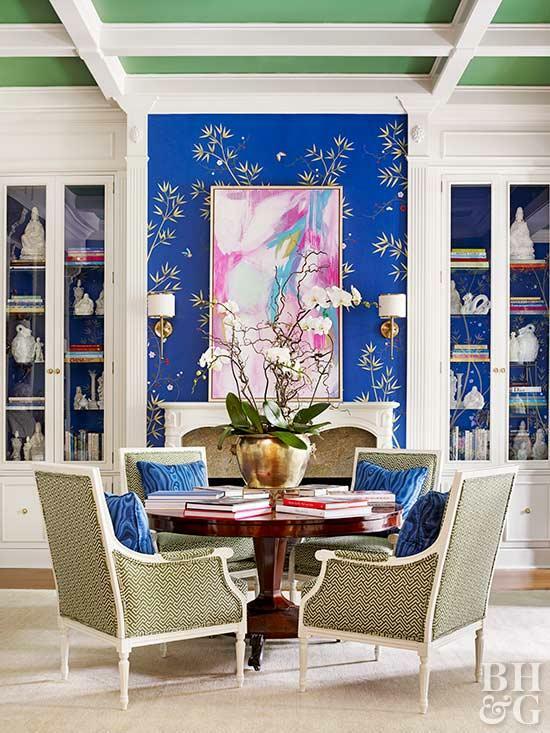 The bright white molding complements furnishings in various neutral shades and sets off rich blue-gray walls. If you have an exposed ceiling it gives an industrial look to the living room. 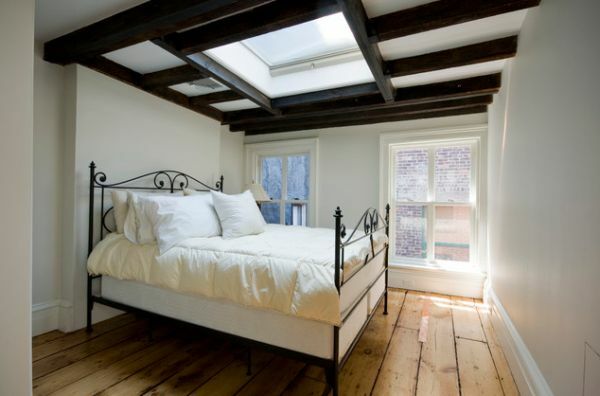 The open beams make the room look taller and reflect the home's original ceiling style and building materials. 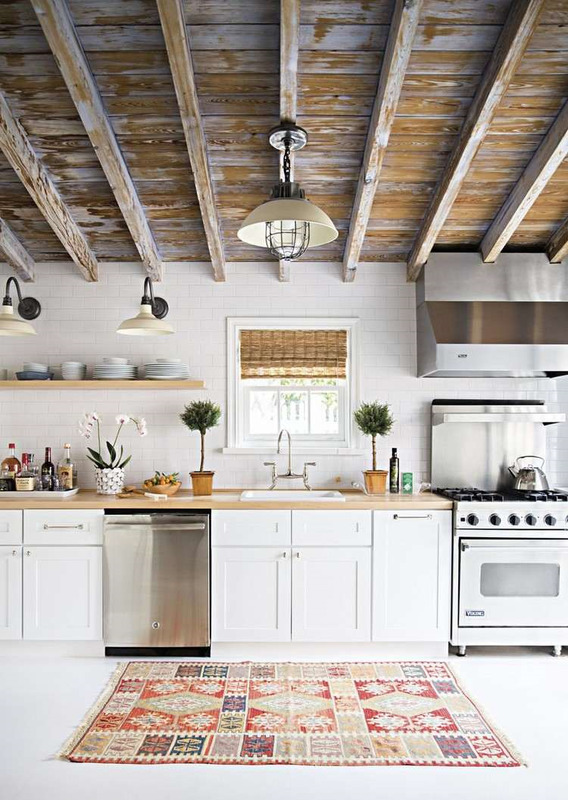 Paint them white for a softer look or leave them natural to create the vibe of a modern urban loft. A good ceiling helps to make the room feel fresh and compliments the color and vibe of the room. It helps to lift the visual appeal and fell of the room and makes it feel both ergonomic and aesthetic. Thus, you can get the perfect blend of style and substance on your room. 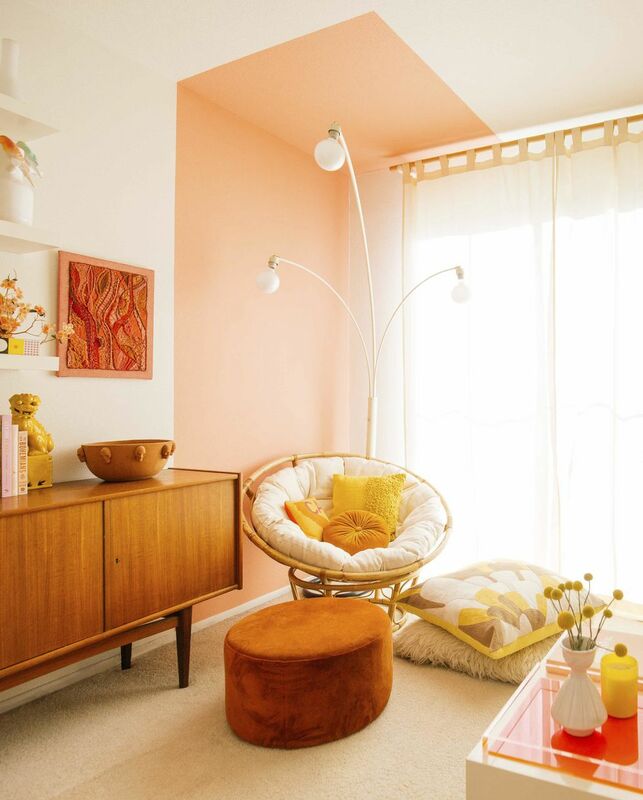 Thus, there are many different ways to accentuate your room by using different ceilings as a focal point. This untapped potential lies in the choices you make and the way you design the décor of the room. You can make use of any of these 20 great ideas or try something entirely new to add some unique character and personality to your home.